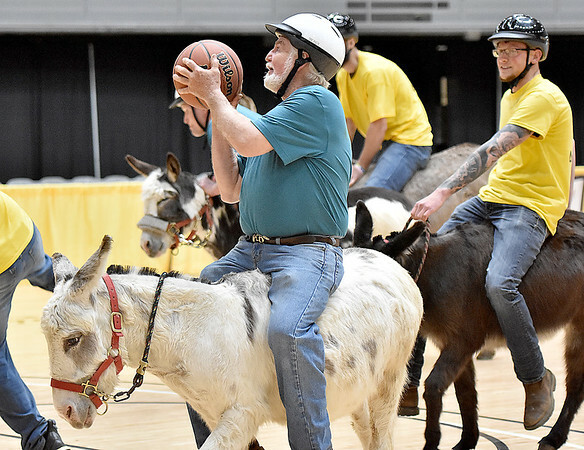 (Brad Davis/The Register-Herald) Butch Ragland gets his donkey in position for a shot as his team, the Jerusalem Cruisers, take on Buddy's Comancheros during a donkey basketball tournament to benefit the Raleigh County Horseman's Association Sunday afternoon at the Beckley-Raleigh County Convention Center. The rules are simple, as it's basically standard basketball, but you must be on your donkey when taking a shot. You can dismount to pick up a loose ball or move around the court quicker, but you must have your donkey in tow at all times when not riding it. RCHA hopes to have a few more of these events in the future.